Towards the end of my AUB days, someone decided to close down the area that held an infirmary in order for some new construction to take place. 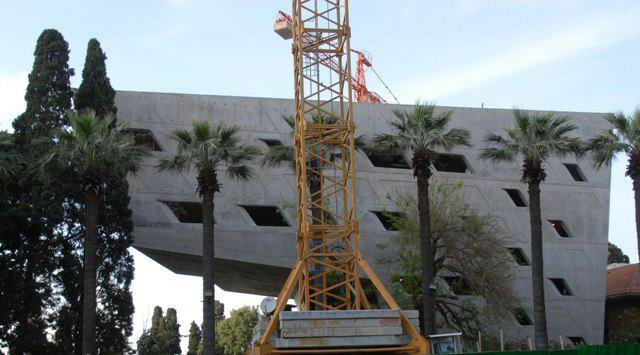 I am not unfamiliar with construction projects at AUB which filled my time when I was there: both the Olayan School of Business and the Hostler student center opened when I was a student. I’m no expert nor do I know anything about architecture but they never struck me as disembodied elements of AUB’s campus. The building depicted in the above picture is what’s standing in place of the infirmary today. Is it hideous? You bet. Is it an atrocity? Definitely. Does it take away from the charm of AUB’s upper campus? Well, it is a concrete block with holes in it. Again, unprofessional opinion here. Why is such an ugly building overshadowing Nicely Hall? Because it has Zaha Hadid affixed to it, the world’s most famous architect, who “won” the competition to build this. As if the pull of her name alone isn’t enough to sway the competition. I have to ask – and it’s obviously too late now for such a question – but didn’t anyone from AUB’s administration get a tinge of nausea as they passed by this growing structure and saw it disfiguring the campus many of them call home? And isn’t the mere presence of such a building disrespectful to the architecture faculty at AUB which is more than capable of coming up with better and more campus-relevant buildings? But I guess this is how things roll around the country: go with the flashiest, most expensive, most prominent names because that’s sure to be better. Issam Fares- no relation-, after whom this building is named, should probably sue them for libel. This entry was posted in Lebanon, Random and tagged Architecture, AUB, Beirut, Lebanon, Zaha Hadid. Bookmark the permalink. I’ve hated this building from the moment they announced its design and put up its picture, I still refuse to accept that it’s actually getting built although it’s near completion. “our design finds harmony between natural and imposed landscapes, producing a building that emerges fluidly from its surrounds”. Are they talking about the same building that’s in the plans there? The inclined windows and walls and floor drive me crazy. I graduated soon after they demolished the infirmary and my visits to AUB have rarely been to upper campus. The building is ugly and it’s worse when yo see it. Students call it the ship. I agree with you Elie 100%, this building really disfigures AUB (see how it covers the Nicely building!) Maybe it would look good in a large area with an open space and modern buildings around, but it definitely has no place among AUB’s historical structures. Yup, I think it’d look nice as a stand-alone structure in a big park with contemporary structures around it. But it doesn’t fit nor does it make sense within AUB. I am a massive Zaha fan and visited AUB when this building went on site so I have an idea what the environment is like. Even I would have to say it looks just awful in this photograph and I cannot imagine it fitting well in the campus at all. I saw some of her buildings and she’s a top architect for a reason. But her work doesn’t work here at all. I have visited 26 out of the 28 buildings she has completed in Europe (#27 and #28 next month). I’d say about 75% of the work is outstanding but the rest really does let her down. Usually for choices of material that are inappropriate to the environment or the ambition overstretches their limits. I think it will be interesting to see how the IFI will work as a 3 dimensional element that spans the change in surface heights of the site but the brutality of the cantilevered top floors very much jars the eye in this context. I had concerns about it from the plans and renders but the photograph above definitley proves that this is not a winner. It seems she was rejected by the faculty of architecture when she initially applied to AUB. Her revenge, maybe? Zaha’s revenge – makes a nice movie title. Well, Nicely is ugly. But compared to this it looks like Versailles. On the other hand, Issam Fares made the donation. And when money talks eveybody shuts up. This is the new AUB: a “futuristic university”. And the worst is yet to come. Nicely is definitely the lesser of all AUB upper campus buildings but yeah, compared to this it’s a masterpiece. Issam Fares is a customer that doesn’t pay, so he deserves an ugly building for all the harm he is doing to honest people. Issam Fares doesn’t deserve better than that!